Did you know that chocolate candy production and sorting LEGO bricks have something in common? They both use the same techniques for turning clumps of chocolates or bricks into individual ones moving down a conveyor belt. At least that’s what [Paco Garcia] found out when making his LEGO Sorter. However, he didn’t find that out right away. He first experimented with his own techniques, learning that if he fed bricks to his conveyor belt by dropping a batch of them in a line perpendicular to the direction of belt travel then no subsequent separation attempt of his worked. 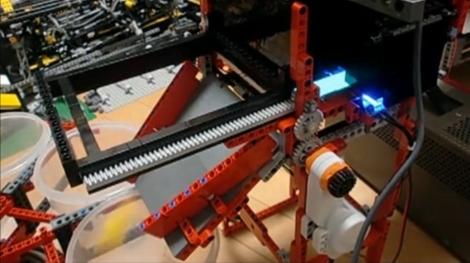 He then turned to [akiyuky’s] LEGO sorter for inspiration and dropped them onto the belt at an angle, ensuring that some bricks would be in front of others. A further trick he found is very well demonstrated in the chocolate sorting video below and shown in the image here. That is to use guides on the belt which serve to create speed differentials. Bricks move slower than the conveyor belt while pressed against a guide but when a brick leaves the guide, it accelerates to the speed of the conveyor belt, pulling away from the bricks still at the guide and thus separating them. A further discovery had nothing to do with chocolate production, unless maybe for quality control. Once an individual brick had been separated out, it had to be classified. To do that he used Google’s Inception v3 neural network. But first, he had to retrain it for recognizing different types of LEGO bricks, something we’ve seen done before for use with recognizing playing cards. And to do the retraining, he needed many images of different bricks all separated into their different types. That’s where he came up with a clever trick. He used his own sorter for that. For example, to get a bunch of images of 1×1 bricks of different colors and orientations, he simply ran them through the sorter, saving the images to files and assigning them to the 1×1 brick class. He then used his desktop machine with a GeForce GT 730 GPU for the retraining, taking around 2.7 seconds per brick. For sorting though, he runs the trained neural network on a Raspberry Pi, taking 3.8 seconds for each brick. The resulting sorter works quite well, sorting with 89% accuracy. Watch it in action in the video below. 3D printers can be used in a manufacturing context. This might be surprising for anyone who has waited hours for their low-poly Pokemon print, but for low-volume plastic parts, you can actually run a manufacturing line off a few 3D printers. The problem with 3D printers is peeling the print off when it’s finished. If only there were a conveyor belt solution for a bed that wasn’t forgotten by MakerBot. [Swaleh] may have a solution to the problem of un-automated 3D printers. He’s designing the WorkHorse 3D, a printer that uses a conveyor belt as a bed. When the print is finished, the conveyor belt rolls forward, depositing a printed part in a bin. It’s the solution to truly automated printing. The use of conveyor belts to automate a batch of 3D prints isn’t a new idea. Way back in the Before Time, MakerBot released the Automated Build Platform, and used it in production to print off parts for Thing-O-Matics. This bit of Open Hardware was left by the wayside for some reason, and last year saw the invention of a new type of conveyor belt-based printer, The Infinite Build Volume Printer (for lack of a better name) from [Bill Steele]. This printer angles the print bed at 45 degrees, theoretically allowing for prints that are infinitely long. This idea was turned into the Printrbot Printrbelt, and the Blackbelt 3D printer was made public around the same time. [Swaleh]’s printer is not of the infinite build volume variety. Instead of concentrating on creating long beams, most of the engineering work has gone into making a printer that’s designed to just push prints out. The conveyor belt bed is flat — and may unfortunately infringe on the MakerBot patents — but if you want a printer that’s designed to dump parts out like a very slow injection molding machine, this is the design you want. The print queue application for this project is just a simple desktop app that serves as a buffer for G-code files. The app sends one G-code file off to the printer, rolls the bed forward, and queues up the next part. It’s simple, yes, but there aren’t too many things that do this now because there aren’t too many printers built to be factories. It’s impressive, and you can check out a few videos of this printer in action below. [gwfong] was in a bind. He had to make a unique Halloween prop that dispensed candy to young trick-or-treaters at a Haunted House. He decided on a conveyor belt system and besides being functional, it also had to be inexpensive to make. After poking around the hardware store [gwfong] had an idea: make it out of items he can re-use after Halloween! As you can see, the main roller system is made of paint rollers. These are cheap and certainly re-useable after the conveyor is disassembled. Luckily for the project, the handle of the paint roller just happens to fit very snugly into a 3/4″ PVC pipe fitting. Four T-fittings and some short lengths of PVC pipe were purchased and are used to mount the paint rollers to a wooden base. A piece of canvas cut to length and sewed into a continuous loop makes up the conveyor belt. A loose belt certainly won’t deliver any candy so two turnbuckles, one at each end, keep the belt tight on the rollers. There is a DC motor that spins a pulley which is coupled, via a standard rubber band, to one of the end paint rollers. A full-speed conveyor haphazardly flinging candy around wouldn’t work out to well so an Arduino and motor shield are used to control the conveyor’s speed and duration. A 7.4 5000mAh Li-Po battery provides the necessary electricity for a nights-worth of un-tethered candy dispensing. This thing is really remarkable. It’s a beer draft system that automatically fills and distributes to your party guests. The approach is something of an industrial revolution for parties. A hopper feeds cups to the tap; once filled they are whisked off to thirsty guests using a conveyor belt system. Many of the parts come from a washing machine that the team scrapped for the build — most notably the motor which drives the belt. But pretty much every part of it is salvaged. For instance, the conveyor belt that transports the full glasses was made from gluing sections of bicycle inner tubes together. To help ease the transfer of a cup from the filling station onto that belt a series of very long cable ties were attached to a pole. The tails from those ties act as a brush to stabilize the cup as an arm pushes it onto the conveyor. The best way to see all of this is to watch the entire clip embedded after the jump. Smart people don’t put their toys away, they build machines to do it for them. Case and point: this NXT project which can sort LEGO pieces. Just dump a bucket of random blocks in a hopper on one end of the machine. One slice at a time, these plastic pieces will be lifted onto a conveyor system made up of several different belts, which allows for separation of the parts. One block at a time, each piece enters a specially lighted chamber where they are visually identified by the NXT brick. Once it identifies the block, a carousel of plastic containers rotates to place the correct home for the block below the output shoot seen above. So do we now have a completed LEGO circle of life? Not quite. You can build structures automatically using a 3D LEGO printer and this sorter will have no problem organizing the parts for that purpose. But we still need a LEGO machine that can tear assembled bricks apart.